Trailers always have a sweet jam and lots of epic eyecandy and then the movie comes out and you're in the theater giving a bert stare. Edited by the_green_drag at 19:59, 25 Nov 2018. If you want to see a good movie for a change then I cannot recommend Overlord enough! It�s not your average zombie movie. Definitly the best movie I�ve seen in years. It started out amazing and while it dropped a bit as the movie went on, it ended really well and I�m gonna go see it again in theaters if I get the chance. You could take the zombie element out and it�d still make a Great War flick. It�s set like the day before D-day or something like that. Anyways, it�s a lesser known movie. If a theater is playing it near you i absolutely think you should go and see this. Watched oblivion, nicely balanced sci-fi/drama. I liked the setting, visual effects and day by day scenes. Edited by Minion at 20:24, 02 Dec 2018. Oblivion starts with a killer premise, as many scifi movies do. I loved the first act so so much. Then it kinda went downhill. Painfully average, I remember saying back in the day. I enjoyed it, but I haven't really been interested in seeing it again. He wasn't lacking a personality though. And no, this is more of a first impression movie. But I am interested to check the material that served as the basis for edge of tomorrow at some point. Maybe not the light novel but it has a manga adaptation. Oh cool. Egde of Tomorrow on the other hand I think is underrated. It was a great movie. Edited by Blizzardboy at 21:42, 03 Dec 2018. Mortal Engines looks either really stupid or really awesome. Edited by blob2 at 11:52, 04 Dec 2018. Well, it's based on popular book series plus it's Peter Jackson behind the adaptation. Might be good. Btw I wonder if Jackson is even still considering Temeraire TV series. He bought the rights quite some time ago, originally planning a movie adaptation. Dragons and Napoleonic Wars would be a cool and a fresh take on fantasy genre. Edited by Blizzardboy at 01:01, 06 Dec 2018. I don't know why moronic fanboys were throwing shade on the 1st trailer. They both look awesome. Jude Law is looking good. I'm pretty sure the cat at the end is going to be the main villain. Edited by blob2 at 23:04, 10 Dec 2018. Wasn't it better to go Space Jam/Roger Rabbit route? Showing cartoon characters as they were taken straight from their worlds instead of making them life-like and caricatural? I think he looks cool. Move adaptions of video games seem to be permanently cursed though. Could be fun but why do his spikes look hairy? And why so serious? I'll reserve evaluation till I know more. 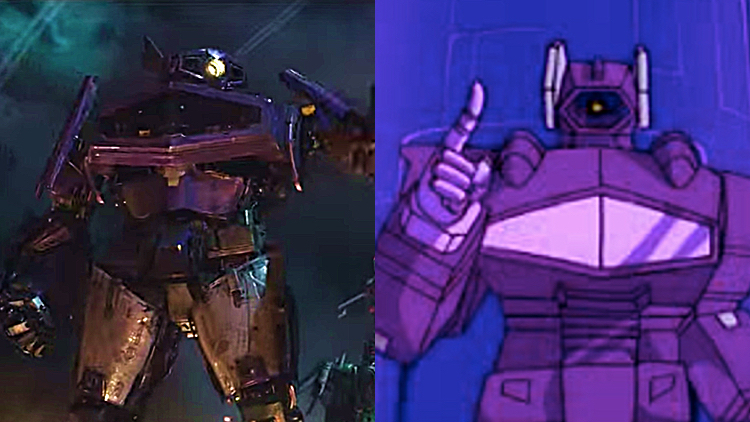 just found out that my fave villain from childhood comics, Shockwave, is going to be in the Bumblebee movie. Take my nostalgia money now! Edited by blob2 at 10:09, 11 Dec 2018. Does these Bumblebee ratings calm your anxiety a bit? Yeah thass what I'm talking about! Edited by blob2 at 22:58, 30 Dec 2018. Aquaman is a really good movie. First DC movie I can fairly identify as one that rivals (and in some cases even outruns) Marvels CU. Ofc we are still talking about superhero movies which aren't and shouldn't aspire to be something ambitious. They've packed so much content (rich sceneries, worlds, creatures) and they still managed to squeeze in a movie which story holds together nicely in under 2,5h. Characters are solid, Momoa is cool and fits into the role (Maori are seafering people so it makes sense), but all the supporting crew also keeps up (and have enough time to shine), even the villains are somewhat likable. A lot of creativity went here, it is a joy to watch the fictious and distinct underwater civilizations. This is some serious material for a whole franchise to be built around it. And the final battle, which can be seen in trailers already, is one of the most epic things I've watched since LotR. Did DC learn how to make things fun? Nice! Dang. That's like my fav X-Men movie. Presuming that you're being honest and not just trying to poke fun at my posting style; i have to ask, why?